FLV stands for the flash video. FLV is a popular container file format which is widely used by the trendy video sharing sites like YouTube, Hulu, Yahoo! Video, Metacafe and so on as the default format for the online videos. Most people are fond of watching videos online on YouTube and other video sharing sites. However, if you watch the FLV videos online every time you need, you have to wait for the video buffering especially when the Internet connection is poor. Worse still, if you forget to save the video link to your browser or if the owner deletes the FLV video for various reasons, you may not have an access to it any more. So it is a good idea to download FLV on Mac at first, and then watch it offline at any time with the family and friends. Basically, these sites do not allow anyone to download FLV videos on Mac directly. Good news is that it is a piece of cake to download those online videos with a professional FLV downloader for Mac in 2019. 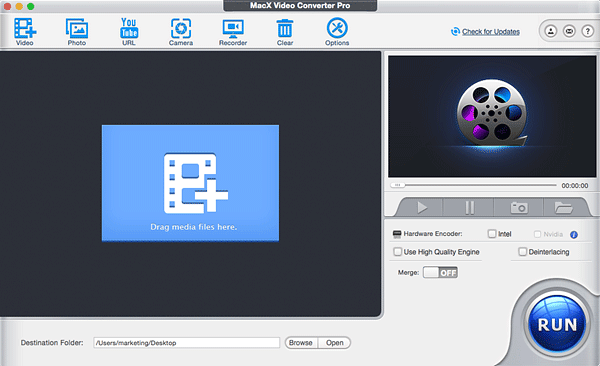 MacX Video Converter Pro does just that for you. It offers a simple user interface and requires people merely couple steps to finish downloading FLV video to Mac with ease. How to Download FLV on Mac Using MacX Video Converter Pro? Launch this 2019 FLV video downloader on Mac, click "YouTube" button, copy and paste the YouTube video URL to the dialogue box. After you click "OK", the rest video downloading job will be automatically done by this video downloader for FLV. If you would rather download FLV video from YouTube or other site to your iPhone, iPad, iPod directly, you only need to select one device from the profiles in the output area. MacX Video Converter Pro is 2019's popular Mac FLV downloader or YouTube video downloader on Mac to download FLV on Mac, download YouTube video to iPhone, iPad, iPod， Android, etc. This multi-functional video downloader for FLV is also integrated with video conversion feature to convert among HD and SD video formats, for example, FLV to AVI, WMV to MP4, AVI to MOV, MPEG, H.264 or convert video to your portable device and media player like iPhone, iPad, iPod, iTunes etc.